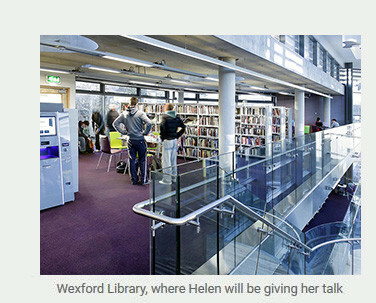 Helen will illustrate her talk with a selection of slides, and there will be a question-and-answer session at the end. It's always a pleasure to swap stories with like-minded outdoor enthusiasts, and Helen looks forward to meeting as many local walkers as possible. The presentation begins at 7.30pm. Mountain Views evening a great success! The annual Irish Mountain Gathering took place in Dublin last Friday, and was a great success. Helen had been invited along as the keynote speaker, and her talk gave ten reasons why hillwalking in Ireland remains her true love, contrasting walking here with a wide variety of venues abroad. Helen was delighted to attend the event, and particularly enjoyed swapping stories with other guests and members of the audience. The presentations by other speakers Tom Kelly (Irish Times Gadget Man), Peter Walker, Simon Stewart and Simon Byrne were engaging and entertaining. Most impressive was Simon Byrne's account of reaching all 454 of Ireland's highest summits in a single year. Big congratulations to Simon - dedication and enthusiasm personified! Many thanks too to everyone at Mountain Views and the Walkers Association of Ireland who made the evening possible. Looking forward to meeting you all again soon! 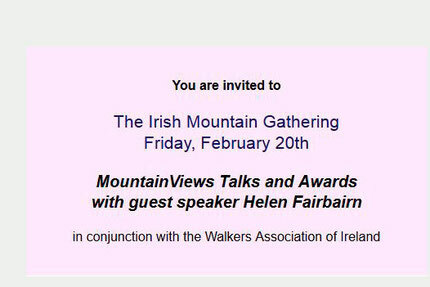 Helen is delighted to be attending the forthcoming Irish Mountain Gathering as the keynote speaker. The event is being hosted jointly by the Walkers Association of Ireland and MountainViews.ie. It's an annual talks and social evening, featuring several speakers from the world of Irish mountain walking. As well as offering a variety of entertaining and informative talks, the evening is a great opportunity to share experiences and make contact with like-minded walkers. Helen is looking forward meeting as many people as possible, and will also be signing copies of her most recent Irish walking guides.